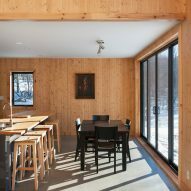 A young carpenter who wished to build his own residence was the client for this modest project by Atelier l'Abri, located in Quebec's Eastern Townships. The owner dubbed the cabin Wood Duck for its ubiquitous material. 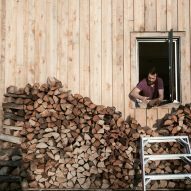 Timber makes up the structure of the home, as well as the exterior cladding and interior finishes. The project is Montreal firm Atelier l'Abri's first house design. "A simple concept, rational plan and traditional building methods were put forward to simplify the construction of the project," they said. The architects sited the house to face south, where a gently sloping landscape provides views of Mount Glen. "The south facade opens fully to the valley. The north, which faces the public domain, is only punctuated by two discrete punch windows," explained the firm. "The topography orients the house plan." The home's layout is square and organised practically. The architects located service spaces to the north, while the main living spaces occupy the southern portion of the house. Visitors enter through the eastern side of the house, where the architects located a lobby and mud room. This leads to an open-concept kitchen, living and dining space that occupies roughly half of the house, to the south. The upper storey is only partial, which creates a double-height space above the living room that reveals the roof's gentle pitch. "On the ground floor, natural light pours down on the living spaces, through a double-height curtain wall set to the south," said the architects. A small staircase leads to the home's two bedrooms and bathroom. 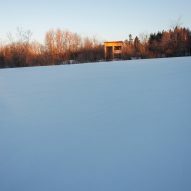 The larger bedroom enjoys views of the ski hill to the south, and a second bedroom used by guests occupies the northwest corner of the plan. 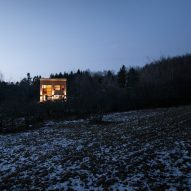 The compact cabin was designed to blend into the landscape. "The evolving and rough nature of its skin preserves the natural surroundings," according to the firm. 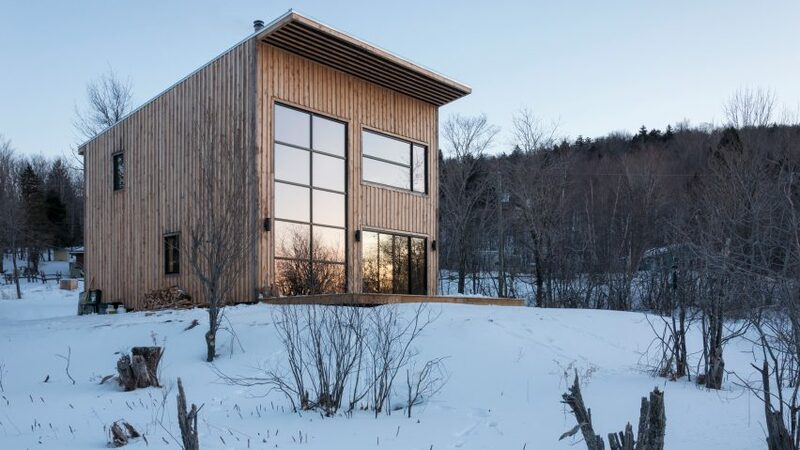 Other projects in the Eastern Townships include an angular black cabin with a steeply gabled roof by Jean Verville and a minimalist white residence comprised of two stacked volumes by MU Architecture. Self-building is an increasingly popular alternative to costly architectural endeavours. For example, Canadian firm Leckie Studio recently put forward a concept for modular cabins that could be flat-packed and assembled like IKEA furniture. Photography is by Jack Jérome.